P/O Henri de Bordas had been on a “rhubarb” (an RAF World War II code name for operations by aircraft seeking opportunity targets). Making land fall at St Aubin sur Mer they picked up and followed the Caen to Cherbourg railway attacking several targets along the way. During the mission they were met by flak and purposely avoided Carentan because of the concentration of flak in the area. Over the small town of Ecausseville, de Bordas lost sight of his partner, he continued to circle for as long as he could, but to no avail. He returned to Westhampnett. Scheidhauer’s aircraft had suffered some sort of damage and started to lose fuel. By mistake he headed west instead of north, after crossing a stretch of water he sighted land which he mistakenly thought was the Isle of Wight. Picking out a suitable field he place his aircraft down into a wheels up landing. Coming to rest in a field of turnips close to Dielament Manor, Trinity. Climbing from the aircraft he was met by locals who informed him of his navigational error, he was in fact in German Occupied Jersey and not the Isle of Wight. Scheidhauer tried to destroy the aircraft, he attempted to acquire some fuel to set fire to it, but there was none, he smashed the instrument panel as best as he could and gave away various items of equipment to the gathering crowd of locals. The Germans arrived after about 20 minutes and he was taken prisoner, ending up at Stalag Luft 111. He was later murdered by the Gestapo for his part in the ‘Great Escape’. En830 was dismantled and shipped to mainland Europe. It reached Echterdingen without guns and ammunition, with the gun ports closed. The radio equipment had been replaced with ballast, but it still had its original Merlin 45 engine. Several flights were made by Daimler-Benz pilots before conversion was attempted. A decision was made to replace the instruments and the entire electrical system with standard German equipment, because the Luftwaffe used a 24 volt system, whilst the RAF used a 12 volt standard. 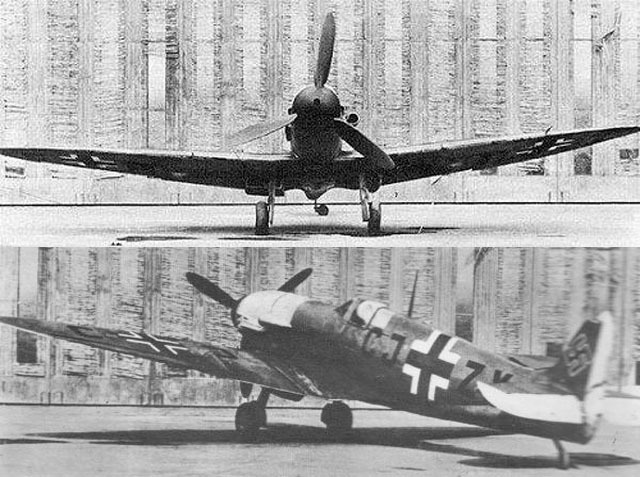 A 3.0 m. diameter Bf.109G propeller was added, together with the carburettor scoop from a Bf.109G. After a couple of weeks, and with a new yellow-painted nose, the Spitfire returned to Echterdingen. Pilot Ellenreider was the first to try the aircraft. He was stunned that the aircraft had much better visibility and handling on the ground than the Bf.109. It took off before he realised it and had an impressive climb rate, around 70 ft. (21 m.) per second. Much of the Spitfire’s better handling could be attributed to its lower wing loading. The Spitfire’s wing area was about 54 sq. ft. (5m²) greater than that of the Bf.109. The Messerschmitt was faster at low altitude, but at 11,000 ft. the speeds evened out. The DB 605A engine gave better performance, according to the test group, than the Merlin, which was rated 150 hp below the DB 605A. 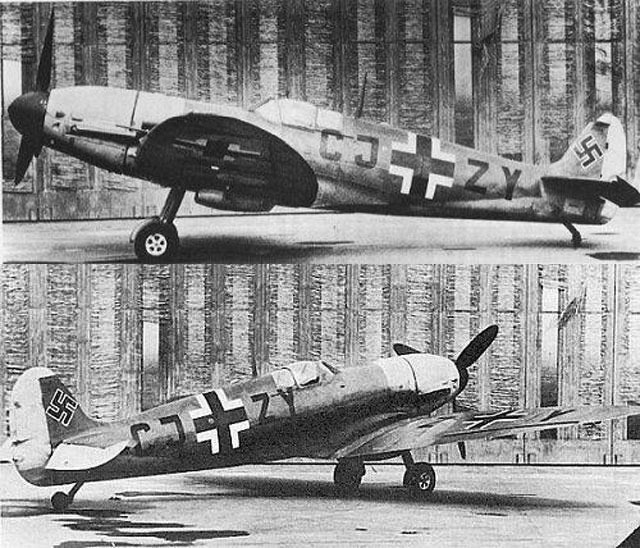 It gave this “MesserSpit” a ceiling of 41,666 ft. (12700 m.), about 3,280 ft. (1000 m.) more than a Bf.109G with the same engine and 5,166 ft. (1475 m.) more than that of a Spitfire Mk.V. A small piece of EN830’s wooden prop still exists from the crash landing in Jersey as does Scheidhauer’s flying helmet. Previous articleWorld War II Airplane Graveyards – What a waste!